As Emily’s love of sing-songy language continues to grow, I’ve stopped bemoaning the strangeness of Mother Goose and started enjoying the way the words roll off my tongue—and the way Emily quickly begins to anticipate and fill in the endings of each line. As such, we have graduated from our abridged board books and delved into the Treasury of all Treasuries: The Original Mother Goose, a reprinting of the 1916 classic, featuring a beautiful purple cloth cover and many of Blanche Fisher Wright’s original illustrations (incidentally, this makes a wonderful unisex baby shower gift if you are a traditionalist). Last year, while I was helping my mom downsize her apartment, I came across her own tattered copy of this same anthology; how often do we get to share with our kids something that their grandparents remember looking at when they were kids? With over 300 nursery rhymes, this anthology is obviously too much for one sitting (too much for me—not my daughter—just to be clear), but therein lies the fun: Emily loves to take her finger and point to which rhyme she wants to hear from a page (ah, the power of choice). I discreetly try to avoid the blatantly offensive ones (“Peter Piper Had a Wife and Couldn’t Keep Her”—seriously? ), because I have to draw the line somewhere. But we giggle, we talk in silly voices, and at two and a half, Emily’s love affair with language is in full swing. She marches around the house making up her own rhymes, stringing together “poop” “goop” “soup” “loop” (the fact that many of her rhymes begin with a potty word is owing to having an older brother). I probably won’t be too sorry when we close the cover of Mother Goose for good, but I will definitely miss her wide-eared enchantment. Warning: a love of Mother Goose can quickly, suddenly transform into a Big-Time Obsession with Dr. Seuss for all the same reasons. 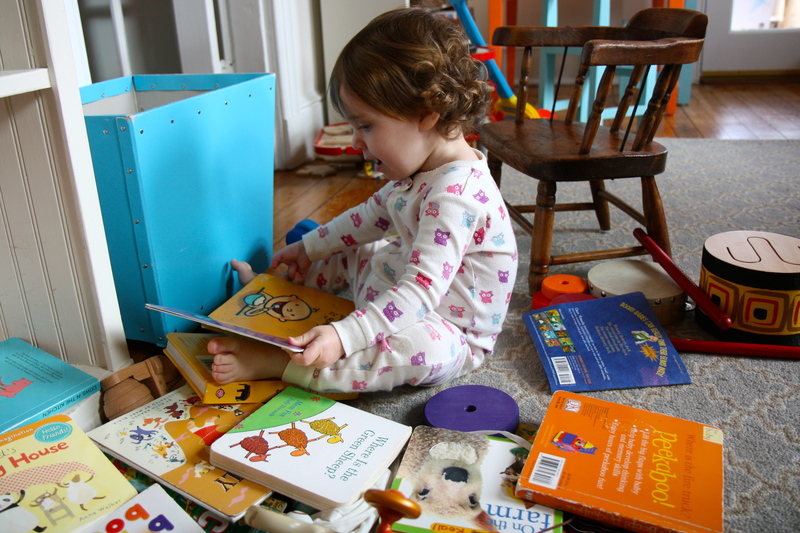 You may find your child demanding that you read the equally nonsensical and often interminable One Fish, Two Fish, Red Fish, Blue Fish nine or ten times a day (you may find yourself hiding said book from said child)…but that’s a post for another day. When you’re reading aloud to babies and toddlers, never discount the Performance Factor. I’ve always considered myself a fairly compelling read-aloud-er when it comes to young audiences (I’ve presided over my fair share of story times at my old store in Chicago), but I’ll admit to being humbled the first time I attended story time with my infant daughter at Hooray for Books!, our fabulous independent bookstore here in Alexandria, VA. These bookstore gals can really hold their own against a crowd of antsy toddlers—and they do so by throwing their own inhibitions to the wind, while invoking no shortage of funny voices, animated gestures, and ad lib phrases. Before I became a regular at these events, I had never given much thought to Lucy Cousins’ Hooray For Fish! 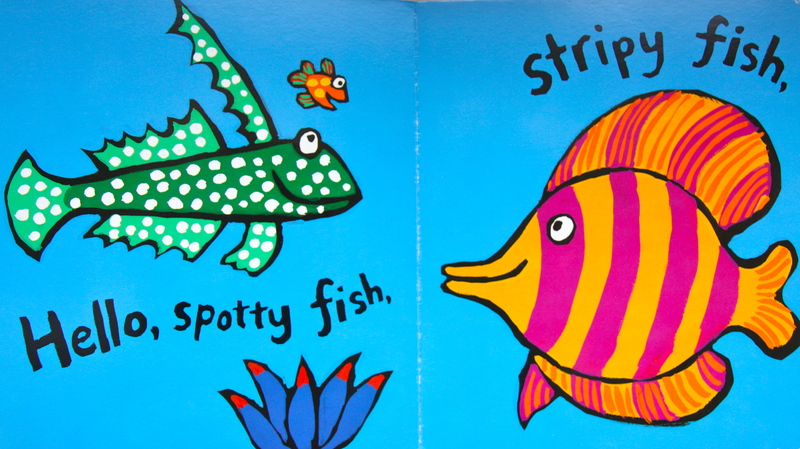 (Ages 6 mos-2 yrs), a board book about a Little Fish who meets and greets all kinds of crazy-looking fish before swimming back to his Mommy Fish. Sure, I’ve always appreciated Cousins’ child-accessible art style: her colorful, loosely-decorated fish, coarsely outlined in black, look as if they came from the hand of a child. But, if I’m honest, the subject of fish doesn’t rank terribly high on my excitement meter (give me a farm animal any day); and I can’t say my son ever cared much for Hooray for Fish! when I read it to him on a plane trip down to Florida when he was one. But the finale is where we break out all the stops: “Where’s the one I love the best, even more than all the rest? [turn page with exaggerated suspense] Hello, Mom. Hello, Little Fish. [more excited waving] Kiss, kiss, kiss, hooray for fish! [throw arms up in air and cover each other with kisses].” Hooray for books that make us adults remember that being silly is a sure way to get undivided attention from our little ones. 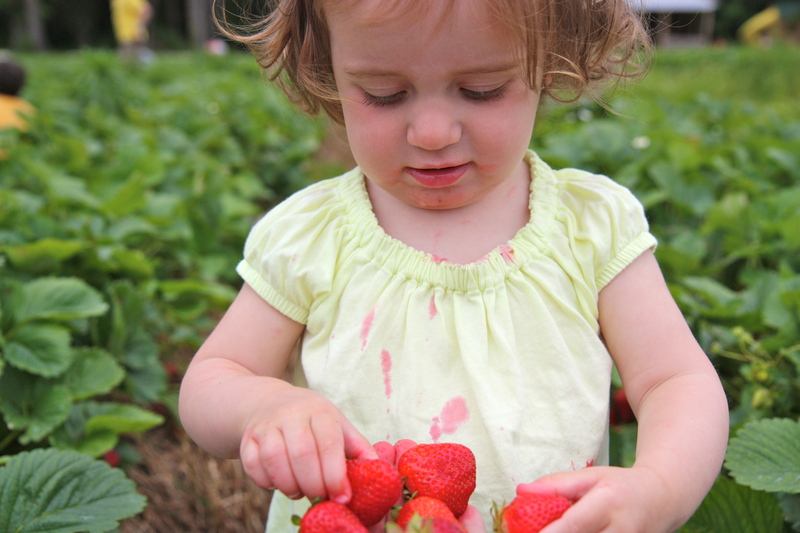 Today’s excursion to pick strawberries at Shlagel Farm in Maryland was the perfect excuse to break out an old favorite: Jamberry (Ages 1-3), by Bruce Degen. Not that we need an excuse to read this rollicking rhyme of a boy and a bear romping through fields and down streams on a quest for every kind of berry. But as the kids and I were filling our buckets with the plumpest, juiciest strawberries I’ve ever tasted, our fingers and shirts and mouths stained red, I couldn’t help but hear in my head: “Three berry/ Four berry/ Hayberry/ Strawberry/ Finger and pawberry/ My berry, your berry/ Strawberry ponies/ Strawberry lambs/ Dancing in meadows/ Of strawberry jam.” We didn’t encounter any strawberry lambs (although there were goats and some very vocal chickens), and my children are likely to eat all the strawberries before I get a chance to make them into jam, but the spirit of the book was very much alive as we chomped our way through the farm. Our excitement continued to build, as we got deeper into the patch, launching ourselves into uncharted territory wherein (as we imagined it) lay the biggest berries. Bruce Degen escalates his rhyme, too, taking it further into the realm of the fantastical and the silly: the boy and the bear fill a train with blackberries, then ride it to Berryland, where they dance alongside a jazz band of rabbits, watch elephants skate on raspberry jam, and finally lift off in a hot air balloon propelled by a giant boysenberry. “Mountains and fountains/ Rain down on me/ Buried in berries/ What a jam jamboree!” Indeed. You are currently browsing the Board Books category at What to Read to Your Kids.